i wanted to start this Thread mainly to help all the EDF-beginners, and of course also the more experienced pilots out there, to sort out the the good, form the hmm...lets say less good, EDF jets. 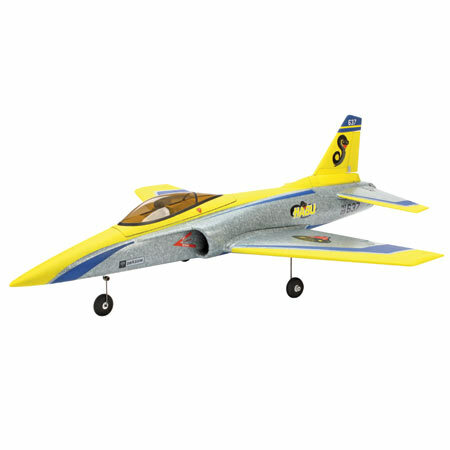 (And for the record, if i talk about beginners here i mean the Pilots who can already fly a modelairplane, and want to get in the EDF-Jet side of the hobby). I mean every plane has its flaws, im sure we all agree about that, but im sure we also agree that there are some planes on the market that are more suitable for EDF-beginners, while others are more for the more advanced pilots among us. And maybe there are even planes out there that should be avoided by all of us, who knows. The idea is to talk about the planes, and why "YOU" think its a good or maybe a less good plane. To find answers about the questions like that....Is it suitable for an EDF-beginner, or is it one for the advanced pilots, do you need the best lipos to fly it or will you be fine with your standard 20C packs aswell, do you need a mile to land it or is a postcard big enough...i guess you know what i mean. The first EDF I flew was the 50mm F-18 by JPower and sold by HK and Banana Hobby. 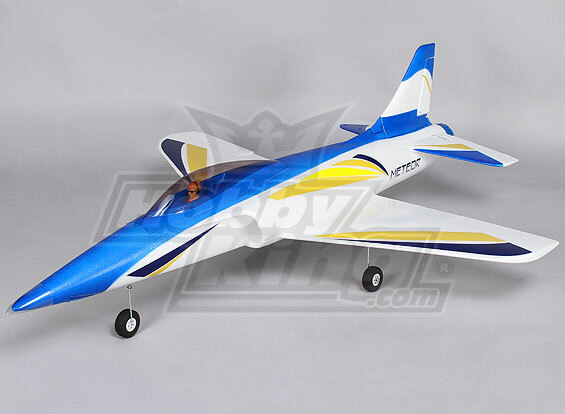 It flies great, but is really easy to lose orientation due to its dark color (Blue Angel scheme) and small size. I own the 50mm Mig-15 of the same series. She is a handful. Because of that, it is NEVER boring to fly! The 50mm F-86 flies like its on rails. I would definitely recommend it as a first EDF. Im have to say im a bit surprised, that the you recommend the rather smalish F-86 (50mm EDF) as a first EDF. I always thought these little birds are much to squirly...maybe i should take a look at it. And on the colorscheme topic, you are totaly right, some planes might look very cool on the ground but they are damn hard to see when they are up in the air...got into trouble because of that a dozen times . The Skyangel series fly like big planes. I'm pretty impressed. I have the A-6, though I certainly wouldn't recommend it as a first EDF, mostly because it stalls if you look at it wrong. 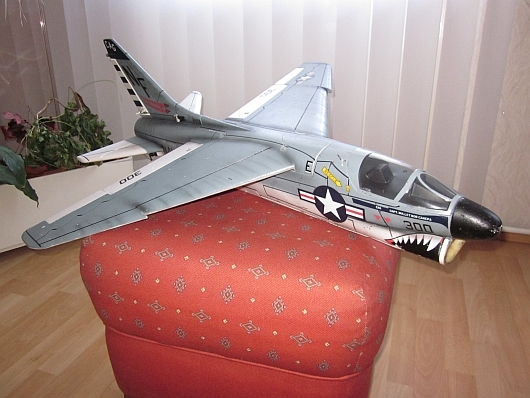 welll here a Plane that i would recommend as a beginner EDF, The J-Power A-7 Corsair II. Its a midsize plane (810mm wingspan,flyingweight 860g) with a 70mm EDF unit, that flys on 4s 20-30c 2200 mAh lipo pack. It is easy to handlaunch because of its shoulder mounted wings, so you have a nice solid grip on the fuselage to give it a strong push for a save take off. The same reason makes it easy to land because you dont have to worry that the wings get hooked up in the grass, specially if you come in a bit faster. Its easy to handle in the air and the flighttime is also ok (up to 6min + reserve). Its not a speeddemon but thats also a reason that makes it almost ideal for beginner. Still it needs a bit of space and some practice to do a soft and short landing. My plane is almost stock, i just installed a rudder which is not really needed, it just gives you a few more options. One of the best things we did with my sons Habu was up the esc and run it on 5 cell. Not tons faster but much shorter take off rolls and crisper throttle response. Son says about 10mph faster. 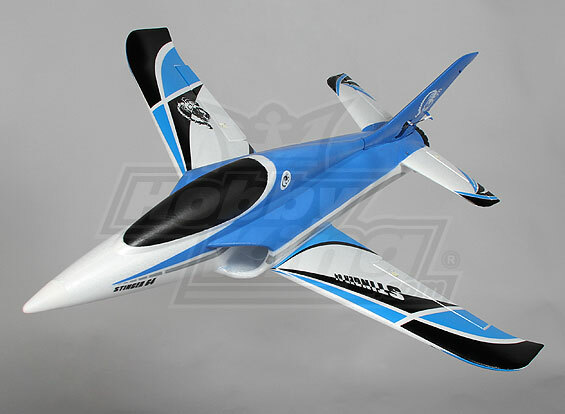 I heard a lot of good things about the Habu, about its handling and speed (never flew one to be honest) and the only reason i didnt baught one is that i dont like how it looks, not a very good color scheme if you ask me, i like my planes to have real life examples, still the flightcharacteristics seem to be very good. And i prefer to fly my EDF's without landing gear which i think is, at least for smal- and mid-size planes, just extra weight and lots of drag. And to be able to handlaunch a plane by myself is a must, or in other words a minus if i need someone else to help me with the take off. 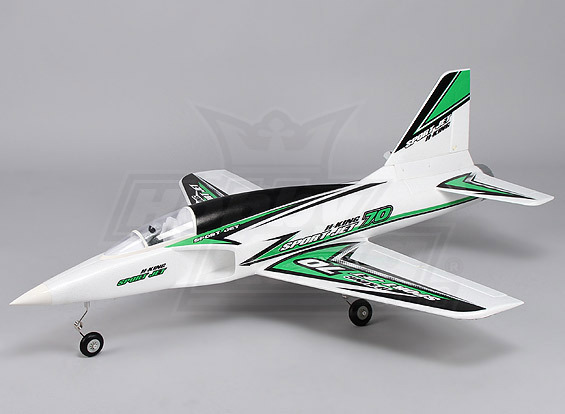 It's a fast plane, looks cool enough, has good slow characteristics (if light enough) and comes in dirt cheap kit form so you can set it up how you wish. The Stinger 64 would be another option as well. Haven't flown it myself but looks good for a smaller 64mm EDF. Available in blue or red and PNF or RTF. The Parkzone Habu is another one that previous people have mentioned. Still available in Australia however it's price would rule it out for me as a first time EDF ($399 in Australia). Much rather crash and wreck a (roughly) $100 model than a $400 model.